We all care about the environment, but there is a lot of dross written about hovercraft and the environment by the confused and mis-informed living amongst us. Many environmentalists rely on hovercraft to access tidal zones to check for water pollution since hovercraft are the only vehicles capable of all-terrain operation – why are ATVs so called? Hovercraft generate no water slap noise. RIB boats and speedboats generate slap noise as they jump waves – a hovercraft glides on a cushion of air about 8 inches above the surface. Hovercraft do not generate the high speed repetitive whine of fast revving engines associated with PWC’S, sometimes referred to as the Angry Bee Noise. Hovercraft are configured with water cooled engines that dampen sound, so these are less noisy than air cooled engines. Unlike jet Skis and motorboats, Hovercraft does not use sea water to cool engines, and have their own cooling system so cannot contaminate water through use as cooling. Many hovercraft use fuel efficient 4 stroke engines. Since they don’t have to push the ocean apart like a boat, they are quite fuel efficient. Hovercraft do not emit harmful exhaust gases into the water to pollute the marine environment. Hovercraft make no wake as they glide over the surface, minimizing any possibility of shore erosion or disturbance. The lack of underwater turbulence also means that the riverbed will be protected. No thermal disturbance – a hovercraft’s engine is cooled via a self contained water cooling system, therefore, there is no thermal disturbance to the river due to river water being used for cooling purposes, as occurs with conventional water-cooled river craft. There is no propeller disturbance, so no chance for damage to coral, river flora and fauna being physically damaged or disturbed. Note – motorboats and Jet Skis regularly harm manatees and sea turtles with propellers, and are having a harmful effect on the marine life in Florida. Propeller noise is also absent, so Hovercraft are less likely to disturb marine life. There is no requirement for shore modifications to accommodate hovercraft. Since the Hovercraft is designed to operate on shore, support structures such as docks or piers are unnecessary. Refuelling can be accomplished on land, eliminating any potential of water pollution due to spillage during refuelling operations. 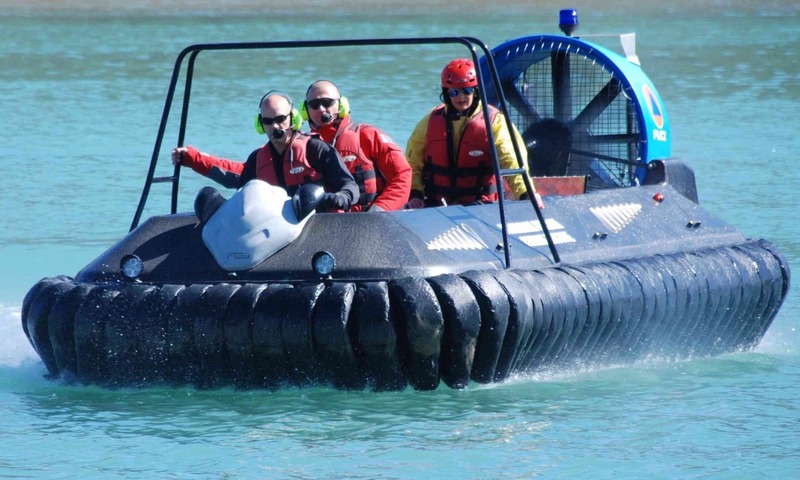 Safety Contribution – Hovercraft can make a significant contribution to safety, as it is a craft that is able to access all areas at low tide, unlike many craft. Many people think hovercraft are as noisy as air-boats that reach 120 decibels, they are not – modern hovercraft typically reach levels of up to 80 decibels. Decibels are measured as log values, so if you do not know how noisy 80 decibels is, here are some comparisons.